Once your herb-scented candle is done, use the included seeds to grow your own little garden. There are few things better for soothing the heart and soul than a walk through a lush garden at twilight. This candle lets you enjoy (or share) some of that magic in any place or season. 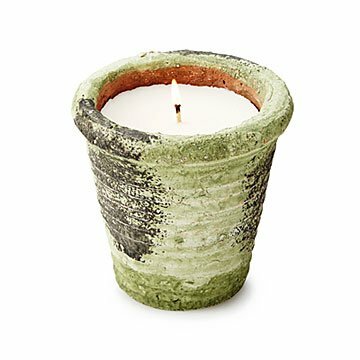 The candle comes in a flower pot, and is scented with vibrant mint and basil with notes of bergamot and sandalwood. Not only that, it also comes with a plantable disk of oregano, basil, and parsley seeds, so that, once your candle is done (approximately 60 hours later), you can grow your own little bit of heaven on a windowsill or sunny kitchen counter. Made in New York. Keep wick trimmed to ¼". Do not allow trimmings to accumulate in wax pool. Place on heat resistant surface, and avoid drafty areas. Discontinue use when ½" of wax remains. Love the smell of this candle. And the flower pot it is in is perfect. I may need to order a few more for gifts for my family now.